A district attorney in Texas has calls to stop seeking death sentences, but his decision is not gaining much traction among other prosecutors in the state, which has the highest number of executions in the U.S. The Supreme Court agreed last week to review lethal injection procedures following a challenge from two prisoners in Kentucky who claim execution by lethal injection amounts to cruel and unusual punishment. Nueces County District Attorney Carlos Valdez said Monday his office would waive the death penalty and seek prison life sentences until "we can get some direction from the Supreme Court." Valdez said his new policy is merely a precaution to avoid sentences being reversed for new punishment hearings. Nueces County has four inmates on death row. But other prosecutors say if the Supreme Court sides with the Kentucky inmates, Texas and other states merely would have to resort to other methods of execution. "We don't have to change," said prosecutor Rene Guerra of Hidalgo County, who has 11 men on death row. Guerra said his office would continue to seek the death penalty and he doubted advocates will be able to prove lethal injection is cruel and unusual. Even if they do, prosecutors can continue to pursue death sentences, Guerra said. John Montague, an assistant district attorney in Tarrant County, which has 26 death-row inmates, said prosecutors there have not changed their policies. "In fact, we're in the midst of jury selection in a death penalty case right now," Montague said. Jury selection also was under way In Harris County, where prosecutors were seeking the death penalty in a capital murder case. Harris, the state's most populous county, has 122 inmates on death row, the most by far. The county also accounts for about one-fourth of all the 405 Texas prisoners who have been executed by lethal injection since the state resumed carrying out capital punishment in 1982. The Harris County district attorney was not available for comment Tuesday. The Texas Department of Criminal Justice, which administers lethal injection executions in Huntsville, Texas, said death warrants specify the condemned inmates should be given "intravenous injection of a substance or substances in a lethal quantity sufficient to cause the death." 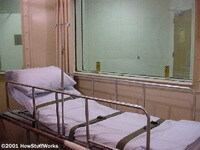 Texas switched from electrocution to lethal injection in 1977 after the Supreme Court allowed the death penalty to resume. The three-drug combination consists of 120 milliliters of solution containing 3 grams of thiopental sodium, 50 milliliters of solution containing 100 milligrams of pancuronium bromide, and 70 milliliters of solution containing 140 milliequivalents of potassium chloride. The drugs are administered sequentially with intervening saline flushes over about five minutes. Changes in lethal injection procedures, such as dosages and chemicals, would not require approval by the state Legislature or the Texas Board of Criminal Justice, agency spokeswoman Michelle Lyons said Tuesday. Ten of the 37 U.S. states that use the three-drug cocktail have suspended its use after opponents alleged it was ineffective and cruel, according to the Death Penalty Information Center. Texas officials, including Gov. Rick Perry, have said there are no problems with the state's execution procedures and will examine each case individually. Twenty-six people have been executed by lethal injection in Texas this year. Diplomats and human right organizations met at the United Nations last week to push for a worlwide moratorium on executions with the goal of abolishing the death penalty in all countries. The U.S. and China, which both have the death penalty, oppose the moratorium. Capital punishment is no longer carried out in 130 countries.